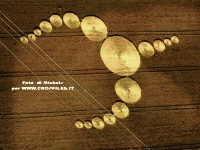 Crop circles - Lightning positions verified by device. Explanation, decipher, decode, discovery, break code, explaining, decryption, puzzle out, scientific research. On this page will be published various photos of crop fields from places verifiably hit by lightning. These images were taken in the years 2008, 2009, 2010, when there existed a possibility today unavailable - with an accuracy round tens of meters to determine the type (C-C, C-G), GPS locality, time and peak intensity (kiloamperes) of the lightning during a thunderstorm. It was an experimental operation, will be explained later. Some more information about the principles of locating positions of lightning hits and used systems will be here. Inseparably accompanying any regular patterns. If not immediately, but later. Why not, as well as those arising from absolutely the same reasons. But during the creation of regular patterns there happens hardly definable and randomly ongoing parallelism of several coincidences. 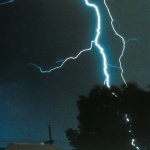 Thanks to this result is not effects of mechanical and electromagnetic forces after lightning discharge, "disarranged". In the case of irregular patterns nothing of the sort will not happen, therefore also attracted virtually no attention. Again should be emphasized: a regular pattern is created in about one case in a million, or less, and the vast majority of cases, whether they are regularly or irregularly flattened (damaged, weakened) crop, lodging (damaging, weakening) occurs until many days after the storm, even more weeks. Certainly will not be exception period longer than two months (observed). Of course, largely depends on the constitution of crops. For example, the effects of barley show much faster than the wheat. Effects of lightning discharges on crops are in the literature devoted minimal attention, and almost always at the mention about it is explicitly stated, the reported reason is very easily changeable with the effects of many other phytopathological factors, and in many cases that they are really changed one another. That any other are of course a secondary consequences in any of such case. Plants that were not affected and weakened by electricity would have not been even touched by similar harmful effects. The total area of irregularly lodged (damaged, weakened) crops and in other ways damaged plants, which occurs annually in the world through exposure to electric current following lightning strikes, represents from crop fields rough estimate of area 0,5 - 1,5 million square kilometers, is estimated to be much more than a million times larger area than in the case of regular patterns, as well as approximately a million times more cases. 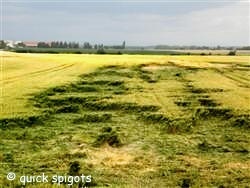 Grass and not sown areas are being left out of this consideration.